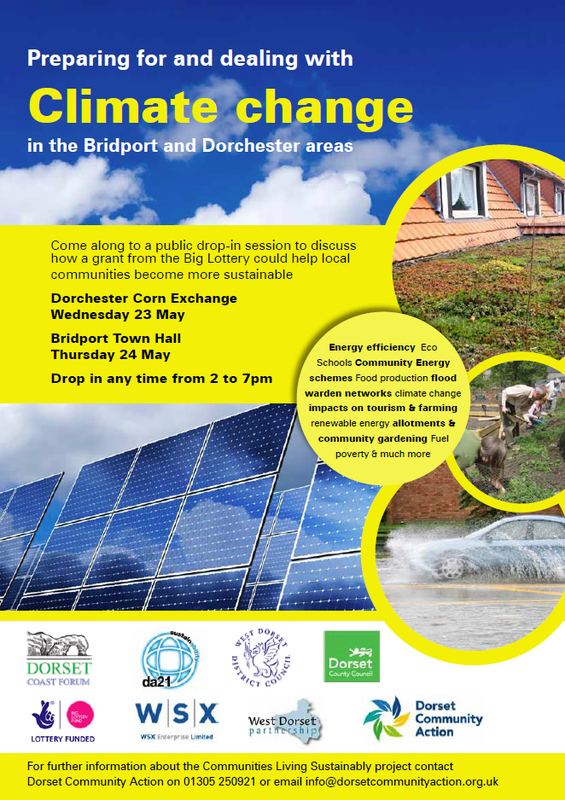 Pop along to a public drop-in sessions in Dorchester or Bridport to discuss how a grant from the Big Lottery could help local communities become more sustainable and to help tackle climate change. This is your chance to see where community groups and residents can help shape the Communities Living Sustainably project. The Communities Living Sustainably project aims to make the two towns of Dorchester and Bridport, and surrounding rural parishes, more sustainable in the face of climate change. Funding has already been awarded to develop the project, and it is hoped that Dorchester and Bridport will be one of ten areas across the country to be awarded a substantial grant to tackle issues such as local food production, home energy efficiency, community sustainable energy and work with schools. Visitors to the drop-in sessions will be able to find out more about existing projects and help shape new ones. They will also be able to meet representatives from the partner organisations which include DA21, the West Dorset Partnership, the Dorset Coast Forum, Dorset County Council, Rural-Net and Dorset Community Action. For further information about the Communities Living Sustainably project contact Dorset Community Action on 01305 250921 or Simon Thompson on 07974 723087.